Is crafting (e.g., knitting, crochet, woodworking and so on) good for your mental health? This question has been in the media lately, but the evidence isn’t clear-cut. Most of the evidence cited is based on surveys, and in some cases results from studies that did not directly focus on crafting have been extrapolated to support the theory that crafting benefits well-being. The Yarnfulness Project is a public engagement project designed to engage the public on this topic as a preliminary step, before applying for research funding. Running from January to June 2018, the project aims to engage with local and online ‘crafters’ to design and co-produce research into the potential benefits of activities like knitting and crochet. The roots of the project go back to the 2017 Curiosity Carnival ‘Knit a Neuron’ event. 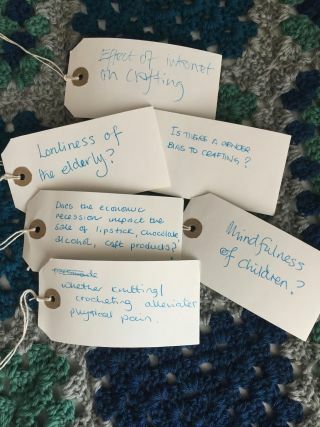 We took part in the event and found that many people were curious about the evidence around the potential benefits of knitting and crochet for mental health and well-being. It does make intuitive sense that enjoyable leisure activities might improve well-being, and even that there might be something specific to creative activities, like knitting, that could provide a particular boost. It does make intuitive sense that enjoyable leisure activities might improve well-being, and even that there might be something specific to creative activities, like knitting, that could provide a particular boost. People report anecdotally that when they engage fully in an activity with repetitive motions, the experience is similar to mindfulness or meditation – perhaps this has a positive impact by encouraging a state of “flow”. The term flow has been used by Hungarian psychologist Mihaly Csikszentmihalyi to describe an altered mental state brought on by concentrating on a challenging task. It is a state of complete absorption in the task in which the outside world seems to disappear, as attention is focussed entirely on the task at hand. It’s clear that such a state could lead to a pleasant feeling of joy in the work and relief from stresses and worries. Indeed, even if the craft project does not take up all of your attention, focussing closely on a creative task could break the loop of negative thought that is common in depression or anxiety. 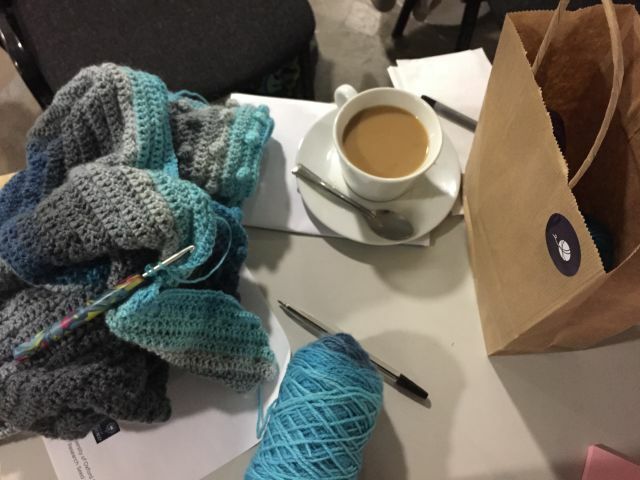 The first aim of the Yarnfulness Project is to engage with the ‘crafting’ public, so people who have an interest in knitting, crochet and other similar pursuits, and conduct in-depth involvement activities related to designing research to answer questions about this topic. With these activities, we hope to understand more about public beliefs regarding creative activities, and design research that answers their questions. We have already set up a website (Yarnfulnessproject.org) where we will post updates on the project, opportunities, and blog posts. We will also ask the public to submit feedback and suggestions for the project and future research. We have been visiting local community craft groups to gauge further interest in the project and do some initial fact-finding. Our flagship event, the Yarnfulness Tea Party, took place on Saturday March 17th. 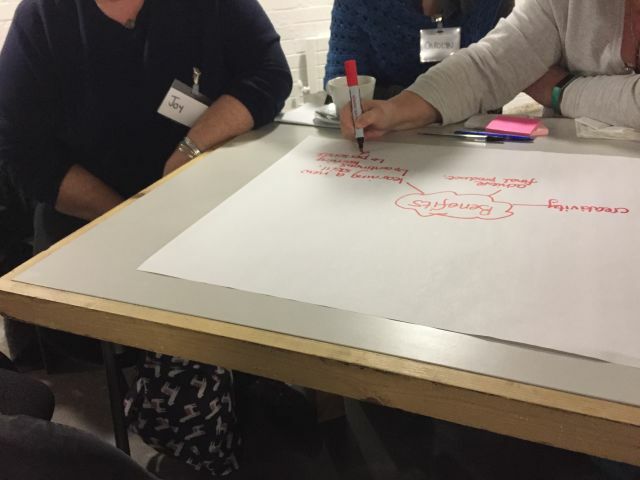 Held at Modern Art Oxford, this three-hour event allowed anyone with an interest in yarn-based crafts to learn about psychological research and what the current evidence means, and to contribute their views on which topics they think future research should cover. We hope that some of those who attended will be involved in designing specific research projects at a later date as project contributors and co-applicants. Our tea party attracted people from a range of backgrounds, including teachers, entrepreneurs and working people who feel crafting benefits their mental health. Our tea party attracted people from a range of backgrounds, including teachers, entrepreneurs and working people who feel crafting benefits their mental health. 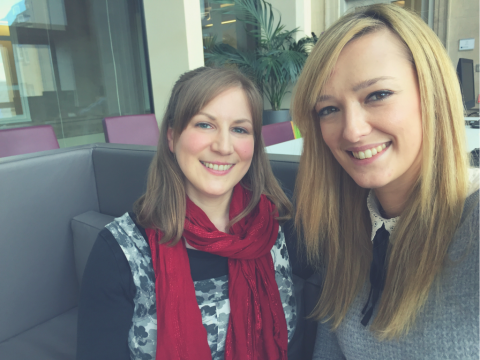 Our aim for the day was to run an event free of research and academic jargon. We therefore held the event in a non-university location, and tried to gather feedback and comments using guided discussion, rather than static and formal feedback forms. Participants were also asked to leave comments and research ideas on our ‘knitting feedback tree’. We began the day with an overview of research given by Emma, who discussed types of research, how a study is put together and what an experimental study looks like. This enabled anyone who came to see what research has already been done, and what direction we hope to take the project in, given our research background and experience. Participants then introduced themselves and discussed the idea of crafting for wellbeing, with many useful insights and perspectives being presented. After a break for tea and cake, Anne Ferrey discussed the potential benefits of crafting, drawing on existing evidence, and solicited ideas from the attendees. It was encouraging to hear that some ideas we as researchers held privately were also suggested by members of the public. It was also refreshing to hear new ideas and avenues for exploration we had not previously considered. Methodologies, populations and protocols were all discussed in depth, leaving us with a number of options for future projects and programmes of research. Whilst we had initially hoped for twenty people to attend the event, we found that having nine attendees on the day allowed discussion to flow quite easily. We reflected that many more attendees would likely have diluted the rich conversation, and points would have been missed. Our event was diverse in terms of attendee age and occupation; however, all nine attendees were women. We will therefore make more effort to include a male voice in online involvement activities. Our view of the research topic has broadened in ways we could not have imagined when it was first conceived, but also confirmed that research on well-being through craft is in the public interest. The next stage of the project requires the research team to decide which avenue of investigation to follow. From here, we will form a smaller panel of 3-4 public members to help us refine our research questions and design study protocols. We hope that at the end of this 6-month project we will have designed a few different studies, which will then be submitted to various organisations for funding consideration. Our event even led to suggestions for funding and support, which was unexpected, and opened our eyes to the different stakeholders and funding opportunities that might be available to this multi-disciplinary project. This project has highlighted the importance of involving the public in research design from the initial conception stages. Our view of the research topic has broadened in ways we could not have imagined when it was first conceived, but also confirmed that research on well-being through craft is in the public interest. It should also be noted that this method of working need not be a chore; the process of interacting with enthusiastic members of the public has been an incredibly enjoyable experience for both of us, and we look forward to continuing the project in the same vein. You can keep up to date with the project at www.yarnfulnessproject.org and via our mailing list.